"I almost gave up,," the defender, 23, told BBC World Service's Sport Today. "I thought I was going to be shot." "They were shooting drastically," Anaemena said. "They commanded us to lie down. I was hit with a gun in my head. "The trauma, the emotion was bad for me. The robbery lasted for four to five minutes. "We knew everybody had to surrender because they had guns and were shooting upwards. You never can tell that if anyone fights back they could shoot us. "They ran into the bush before the policemen came." 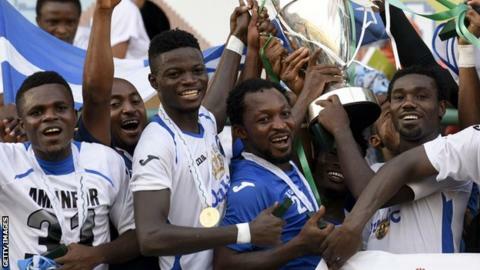 Enyimba, twice African Champions League winners who sealed their seventh Premier League title last season, were on their way to Kaduna in the north west of Nigeria for a pre-season tournament when the attack happened near Okene, in the State of Kogi. The Super Four tournament, which also involves Warri Wolves, Nasarawa United and cup winners Akwa United, begins on Wednesday. Anaemena said the Enyimba players still intended to take part. "We're pulling ourselves together," he said. "We can't say we won't play because of the trauma we have been through." Anaemena urged his club to "improve our welfare" by letting the team fly rather than travel by road. A club statement said: "The club is in talks with some airlines to form a partnership so that the players can travel by plane to distant match venues. "Those talks have not been completed, so the players had to travel by road." Last year, five players from another Nigerian club - Kano Pillars - were wounded when their bus was attacked by gunmen while the team were on their way to a league game.